Max Jacobson has had a rousing career spanning almost 30 years in food journalism, but he’ll be happy to fly under the radar if he loses some weight. His career took flight in 1984, when he signed on at the Los Angeles Times as a writer on Chinese and Japanese food, and expanded into food and wine writing shortly thereafter. 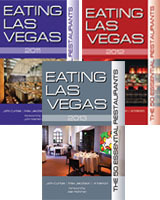 He was fortunate to arrive in Vegas when the food scene really began to blossom and has been a food writer and editor there since 1999. He lives in Henderson with his wife, without cats, dogs, or birds.